Length: 90m Shipyard: Oceanco Exterior/interior design: De Basto Designs/Nuvolari Lenard Sometimes in yacht design, initial concepts can appear futuristic, as Luiz de Basto says his probably did for this 90m Oceanco. But then technology and engineering realities dial down the extremes. In this case, though, the dream has become an extraordinary reality. DAR features the latest advances in glass technology – the superstructure is completely finished in reflective glass, which is offset with white balconies for a distinctive contrast, “providing a constant exchange in shape and lines between the two elements”, says De Basto. Just as exciting is the nature-themed interior by Nuvolari Lenard. Sometimes in yacht design, initial concepts can appear futuristic, as Luiz de Basto says his probably did for this 90m Oceanco. But then technology and engineering realities dial down the extremes. In this case, though, the dream has become an extraordinary reality. DAR features the latest advances in glass technology – the superstructure is completely finished in reflective glass, which is offset with white balconies for a distinctive contrast, “providing a constant exchange in shape and lines between the two elements”, says De Basto. Just as exciting is the nature-themed interior by Nuvolari Lenard. 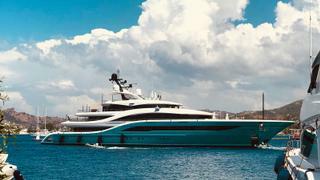 Length: 72m Shipyard: Tankoa Exterior/interior design: Francesco Paszkowski Design/ Francesco Paszkowski, Margherita Casprini Freshly launched this month, Tankoa's Solo has certainly made a splash. You name it, this yacht’s got it: massage room, hair dressing area, sauna, gym, 6m pool – she even has a baby grand piano and fireplace. From the spacious beach club to the main-deck guest accommodation and the private owner’s deck with direct helipad access, the optimised-for-charter yacht is packed with fun features. Freshly launched this month, Tankoa'sSolo has certainly made a splash. You name it, this yacht’s got it: massage room, hair dressing area, sauna, gym, 6m pool – she even has a baby grand piano and fireplace. From the spacious beach club to the main-deck guest accommodation and the private owner’s deck with direct helipad access, the optimised-for-charter yacht is packed with fun features. Length: 77m Shipyard: Turquoise Yachts Exterior/interior design: H2 Yacht Design The Turquoise flagship GO has room for more, accommodating 18 guests, including on the owner’s deck, which features a forward-facing cabin overlooking the sea and a private spa pool on deck. Getting around the massive yacht is easy, with a full-size lift running from the central tender garage all the way to the sundeck, which boasts a 5m pool with waterfall. The beach club is also impressive, opening to the sea on two sides. The Turquoise flagship GO has room for more, accommodating 18 guests, including on the owner’s deck, which features a forward-facing cabin overlooking the sea and a private spa pool on deck. Getting around the massive yacht is easy, with a full-size lift running from the central tender garage all the way to the sundeck, which boasts a 5m pool with waterfall. The beach club is also impressive, opening to the sea on two sides. Length: 63.7m Shipyard: Codecasa Exterior/interior design: Vincenzo Ruggiero Built by Codecasa to a design by Vincenzo Ruggiero and delivered in 1990, Sokar is still regarded as one of the most outstanding superyachts of her era. Accommodation is for up to 18 guests across a master suite and eight double staterooms, all with en suite bathrooms. 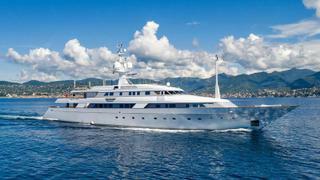 Sokar is currently for sale for €17,900,000. Built by Codecasa to a design by Vincenzo Ruggiero and delivered in 1990, Sokar is still regarded as one of the most outstanding superyachts of her era. Accommodation is for up to 18 guests across a master suite and eight double staterooms, all with en suite bathrooms. 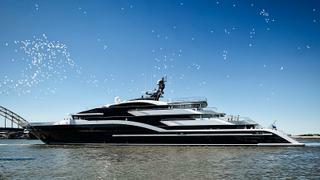 Sokar is currently for sale for €17,900,000. Length: 95.2m Shipyard: Lurssen Exterior/ interior design: Espen Øino/ Reymond Langton Design Kismet’s recent jaunt around the tabloid pages as the charter yacht of choice for A-listers Beyonce and Jay-Z has made this legendary yacht even more recognisable. But she doesn’t come cheap. One week aboard this yacht, which counts a multi-level swimming pool, basketball court and helipad among its star features, will set you back £1.1 million. 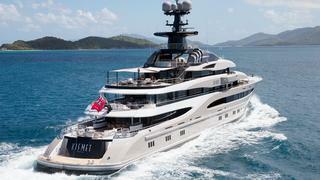 Owned by US billionaire and Fulham football club owner Shadid Khan, the Lurssen yacht took a win in the 2015 World Superyacht Awards and features dramatic interior design by Reymond Langton who created a unique colour scheme for each guest suite. Kismet’s recent jaunt around the tabloid pages as the charter yacht of choice for A-listers Beyonce and Jay-Z has made this legendary yacht even more recognisable. But she doesn’t come cheap. One week aboard this yacht, which counts a multi-level swimming pool, basketball court and helipad among its star features, will set you back £1.1 million. 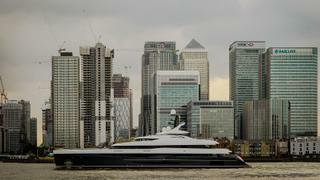 Owned by US billionaire and Fulham football club owner Shadid Khan, the Lurssen yacht took a win in the 2015 World Superyacht Awards and features dramatic interior design by Reymond Langton who created a unique colour scheme for each guest suite. Length: 74.5m Shipyard: Abeking & Rasmussen Exterior/interior design: Harrison Eidsgaard Returning to the German shipyard for their second yacht, Elandess’s owners asked designer Peder Eidsgaard for a modern and spacious yacht with large lounging areas suitable for both family time and entertaining. This translated into an open-plan interior with flexible living spaces between floor-to-ceiling windows, as well as innovative communal spaces – from the Nemo lounge below the waterline to the vast sundeck up top with huge 8m pool. Returning to the German shipyard for their second yacht, Elandess’s owners asked designer Peder Eidsgaard for a modern and spacious yacht with large lounging areas suitable for both family time and entertaining. This translated into an open-plan interior with flexible living spaces between floor-to-ceiling windows, as well as innovative communal spaces – from the Nemo lounge below the waterline to the vast sundeck up top with huge 8m pool. Length: 61m Shipyard: Abeking and Rasmussen Exterior/ interior design: Reymond Langton Currently on sale for €75,000,000, Excellence V offers sumptuous accommodation for up to 14 guests across seven cabins. Built in steel and aluminium by German yard Abeking and Rasmussen to Lloyd's class and delivered in 2012, Excellence V has been maintained with regular upgrades. Her most recent upgrade in 2017 included a superstructure repaint, full main engine service and a rebuild of the generators. 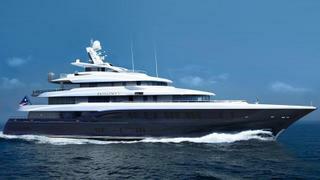 Currently on sale for €75,000,000, Excellence V offers sumptuous accommodation for up to 14 guests across seven cabins. Built in steel and aluminium by German yard Abeking and Rasmussen to Lloyd's class and delivered in 2012, Excellence V has been maintained with regular upgrades. Her most recent upgrade in 2017 included a superstructure repaint, full main engine service and a rebuild of the generators. Length: 67m Shipyard: Feadship Exterior/ interior design: Michael Leach With exterior styling and interior design by Michael Leach, the 67 metre motor yacht Anna I was built in steel and aluminium by Dutch yard Feadship to Lloyd's class and MCA coded with delivery in 2007. The interior, featuring polished burr elm and flame mahogany woods, accommodates up to 17 guests in six cabins. These comprise a master suite with a private sea terrace, a VIP suite, two doubles and two twins plus Pullman berths. 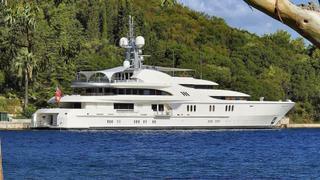 Anna I is currently for sale for €65,000,000. With exterior styling and interior design by Michael Leach, the 67 metre motor yacht Anna I was built in steel and aluminium by Dutch yard Feadship to Lloyd's class and MCA coded with delivery in 2007. The interior, featuring polished burr elm and flame mahogany woods, accommodates up to 17 guests in six cabins. These comprise a master suite with a private sea terrace, a VIP suite, two doubles and two twins plus Pullman berths. 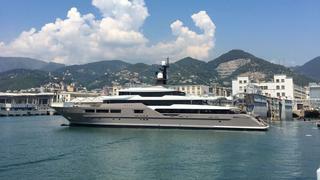 Anna I is currently for sale for €65,000,000.